No matter what you think of Dr. Peterson there is no doubt at all that he is a worldwide phenomenon with sold out speaking tours all around the Western world, YouTube and social media accounts in the millions of views each month as well as this bestselling book. It would be foolish to read just our favorite news sources’ opinions of him when there is so much he publishes himself. So reading his book was a no brainer! And I’m glad I did. Dr. Peterson blends an interesting mix of history (especially totalitarian history) with philosophy, religion and mythology all held together by psychology. So while some chapters may seem like they would go the normal self-help route he takes a long detour around his vast knowledge of these topics to provide insight into why he thinks we ought to do the things we do. In the meantime, we get good advice, some of it used to be called common sense, as well as lessons in all kinds of disciplines. I think that’s important. Too often, readers are told to simply trust the author because, well, they wrote the book after all. But why should I trust someone I don’t know? But make the case with authorities and evidence I can check myself or that I do know and I’m willing to bite. Peterson does that. Well. I made the decision to listen to him on audiobook and it’s the way I’d recommend it to anyone. I love listening to authors read their own work – see Al Gore, President Clinton, President Bush, President Carter, Katy Tur – because you can hear what they really mean and how they really feel by their emphasis and tonal changes. I could hear the passion that Dr. Peterson felt when discussing certain topics as well as the pain. For instance, when he spoke about his daughter’s suffering. Controversy and politics aside, there is no good reason I can think of not to listen to or read this book. His 12 Rules, if followed, can’t possibly be bad for anyone. Quite the contrary, in fact. We could all use more advice and urging to make the most of ourselves, fix ourselves before we try to fix the world (and in fact, fixing ourselves is probably the best kind of fixing the world there is,) focus on what’s good and make the time we spend with people matter by listening well and recognizing that they have something to teach us. There is so much in this book that’s extremely positive I recommend it highly. A note about religion, especially Christianity. One thing that does vex Christians, myself included, is whether Dr. Peterson is actually a Christian in the born again/ giving his life to Christ way, rather than the respect for Christ and God, theist or Universalist way. I thought I had him figured out most of the way through the book as someone who follows Christianity because of what it represents – every character and story is archetypical or represents a greater truth. If that’s true only, and I’m trying to be precise here, then his faith may not be Christianity as we know it. But then towards the end of the book I’m certain I heard more personal faith in both his tone and his words. He points to the Bible throughout without directly proselytizing, but at times, especially in the Pet the Cat section and following, he seems to open up a little more about what his faith does for him. If that’s true and I wasn’t reading into him, then it’s possible that Dr. Peterson may be discussing Christianity in a way that won’t put off readers who don’t believe, while not specifically hiding what he does, but simply using what he understands about Christianity in ways that bolster his claims for universal truths in his Rules. 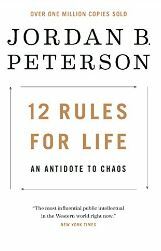 So after reading this long book as listening to many of his YouTube videos and podcasts I am back where I was at the start: I have no idea what kind of Christianity Dr. Peterson has. Regardless, this is not a “Christian” book. But it is a good book. I’ll have to live with the ambiguity of Dr. Peterson’s cat-ness, here.